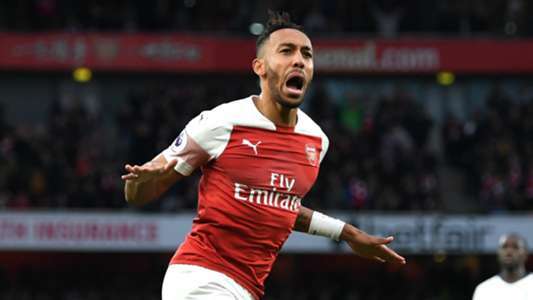 Arsenal manager Unai Emery has challenged Pierre-Emerick Aubameyang to go on and become the Premier League’s top scorer this season. Aubameyang sits top of the premier league goal log, scoring twice in Arsenal’s North London derby triumph over Tottenham to take his count for the season to 10 league goals. Also, Emery wants the Gabonese forward to keep up his hot streak, insisting that Aubameyang can keep on making strides, having featured in all 14 of Arsenal’s Premier League games up until now, making 12 start and 2 from the bench. “We want to help him achieve this and that is because, if he is scoring, he is helping us. The 29-year-old has not constantly played in his favourite central position, but with Emery frequently using the in-form France forward Alexandre Lacazette as the main striker in Arsenal conventional formation, and the Spaniard believes Aubameyang’s versatility is a critical asset to the club. In his career he has played as a winger on the right, on the left and like a striker, he [has] played with two strikers,” Emery added.